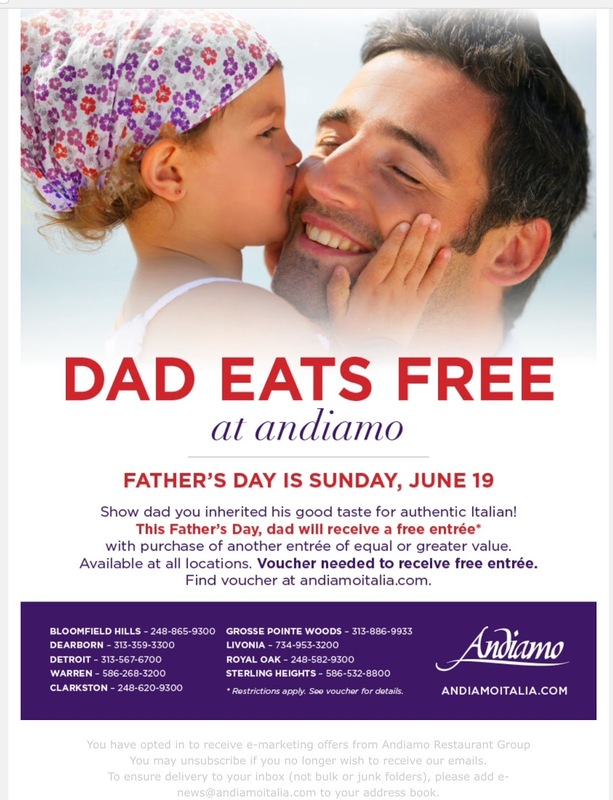 Dad Eats FREE this Father's Day at Andiamo! Father's Day is Sunday, June19th. Show dad you inherited his good taste for authentic Italian! This Father's Day, dad will receive a FREE Entree at all Andiamo locations with purchase of another entree of equal or grater value and purchase of two drinks. Locations include Bloomfield Hills, Dearborn, Detroit, Warren, Clarkston, Grosse Pointe Woods, Livonia, Royal Oak, Sterling Heights. Grazie Dollars may not be redeemed in conjunction with this offer.